Linkletter, the host of two of the longest-running shows in television history, House Party and People Are Funny, often lectured around the country on vital issues of the day. Having attended a small college himself—San Diego State University—to become a teacher until he found out he could make more money as a radio announcer, Linkletter particularly liked traveling to colleges such as Westminster. “One of the wonderful things about going to a small college is you can get into everything,” he said. Linkletter came to Fulton in the third year of a series of Linkletter University Tours sponsored by the RC University Series, an innovative public affairs program of Royal Crown Cola Company of Columbia, Georgia. 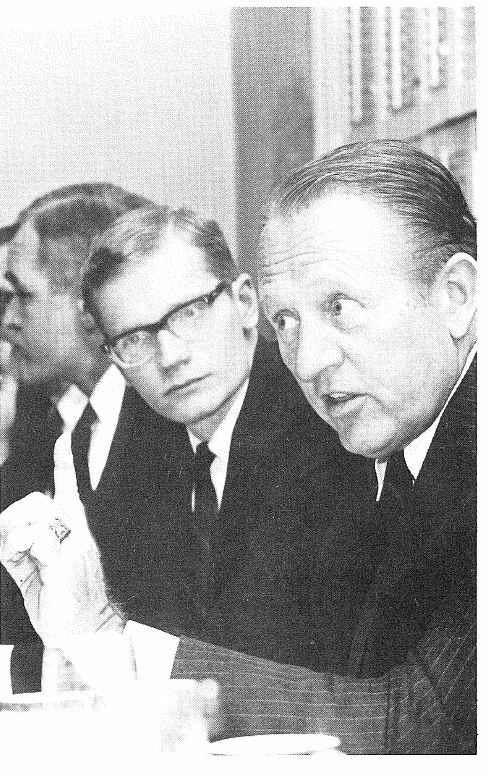 Under this program, Linkletter was allowed to travel free of charge to colleges and universities around the country to discuss the issues and problems of the college generation of the time. The topics could range from the role of the performer to politics, the social revolution, the challenges confronting the American economic system, or U.S. policy in Vietnam. Following the lecture described as “Art Linkletter and the American Student: A Dialogue,” Linkletter fielded a question and answer session and enjoyed a reception at the Westminster student center. Abandoned by his natural parents when he was only a few weeks old in Moose Jaw, Saskatchewan, Canada, Art Linkletter was adopted by local evangelical preacher Fulton John Linkletter and his wife, Mary. At the age of five, Art and his parents moved to San Diego, where he went to school and started his broadcasting career. He became a naturalized American citizen in 1942. Linkletter knew he couldn’t sing, play a musical instrument, or act, but he was a great talker and ad-libber, and one day when he heard a couple of men on CBS radio who had taken a microphone out into the street to do “man on the street” interviews, he knew he had found his calling. His first radio show, People Are Funny, used audience participation, contests, and jokes and became the model for modern television game shows. The program started on radio in 1942 and then moved to television in 1954 and ran until 1961. His show House Party, which debuted on the radio in 1945 and went to television in 1952, was a daytime variety show that started with a monologue from Linkletter followed by audience participation, interviews, musical guests, and comics. One of the hit segments, which Linkletter later turned into a best-selling book, was “Kids Say The Darnest Things.” Linkletter would interview small children and solicit funny answers such as the young man, who when asked what church he attended, said: “We’re either Catholic or Prostitute.” He estimated over the years until House Party went off the air in 1969, he interviewed over 27,000 schoolchildren. When Linkletter’s friend Walt Disney opened Disneyland, Walt asked Art to invest in the park but Art refused, doubting its success. However, he did agree to do an ABC live broadcast of the opening of the park and coaxed actors Ronald Reagan and Bob Cummings to be his co-hosts. When Walt lamented that he had only paid Art $200 for such a great launch of his park, Art asked for the concession rights to all films and cameras sold at Disneyland for its first 10 years, and Walt agreed to the deal. After that, Linkletter joked his bargaining had made him the highest paid personality in television for 90-minutes of work. Two years after his appearance at Westminster, Linkletter suffered the tragedy of his life when his 20-year-old daughter Diane, who had been addicted to drugs, committed suicide by jumping out a sixth-floor window. Her death prompted Linkletter to conduct motivational speaking tours for years to educate about drug abuse. Linkletter was also known as the spokesperson for Milton Bradley’s “The Game of Life” and the hula hoop. A health and fitness enthusiast who never smoked or drank, he lived to the astounding age of 97. 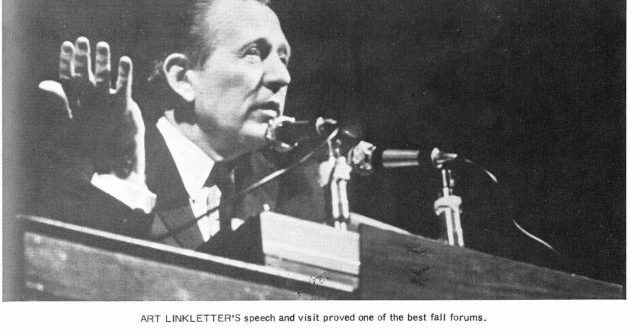 Linkletter said once: “Things turn out best for people who make the best out of the way things turn out.” That philosophy led Art Linkletter to great fame and fortune, and for one brief interlude, brought him to Westminster to deliver a lecture. Dive deeper into Westminster’s history with Westeryears.